1) The station that once existed in Vincentown was heavily renovated and eventually turned into a private office by a local company. A picture of it taken in the 90s appears in an issue of the "High Line" Vol 14. It was located on Main Street, just north of town. Does anyone recall seeing the station then, or in recent years? Does it actually still exist? I've been through Vincentown within the past year and could not find the former station. 2) Supposedly the station that once served Birmingham Jct was relocated in the 70s, several miles away to the side of Arney's Mount where it served as a snack bar for an antique shop complex. Again, does anyone recall ever seeing the Birmingham station in its new location? Does it still exist? Any help on this matter, or any info or stories from the PRR's "Back Road" would most definitely be appreciated! The old South Toms River Station still exists. it was relocated just a stones throw away and is now used as a house. It is located at 239 Halliard Ave, Beechwood, NJ. just off of Rt 9 by-way (Rt By-way used to be the Pennsy ROW). Even after the Pennsy abandoned the access to Seaside (after the bay bridge mysteriously caught fire in 1946), the Pennsy continued to operate in that area. Later in the 1950's, the Garden State Parkway came through and the Pennsy pulled their operation further back to a freight house that was located immediately west and just off the GSP (exit 80). You can see the little S shaped road to the west of the GSP (and in alignment with the Rt 9 by-way) named appropriately enough "Railroad Ave". I believe the northwestern length of this road (very short) was the former ROW itself. Railroad Ave turns into 1st Ave. I think they operated that way into the 1960's, before pulling further back (to Whiting Jnctn or even Pemberton (not sure as to the progression of the pullback). The North Pemberton station was not on the "back road" - it was on what became for a while the Pembertown and Hightstown (P&H). The "back road" to Bay Head crossed Hanover St farther south, just north of the Pemberton Bypass, by Burger King and Magnolia St I think. I would guess there was a station around there. Anyone know if there was and where? pumpers wrote: The North Pemberton station was not on the "back road" - it was on what became for a while the Pembertown and Hightstown (P&H). The "back road" to Bay Head crossed Hanover St farther south, just north of the Pemberton Bypass, by Burger King and Magnolia St I think. I would guess there was a station around there. Anyone know if there was and where? There was a station in that vicinity of the now Burger King. It was known as South Pemberton, and was the first stop after Birmingham Jct on the way to Bay Head. I've been told its foundation could be found in the overgrowth there, long after the station was gone. I have yet to come across any pictures of South Pemberton, or even any info on when it disappeared. Interesting that it is marked on the map as New Jersey Southern, (who built and operated it) and it ended up in PRR hands and not CRRNJ. Yes, I don't know if NJ Southern only built the Whiting to Birmingham Jct (just west of SOuth Pemberton), or if they built the whole piece all the way to Mt Holly and/or beyond. I saw it all explained somewhere once, but who knows where! 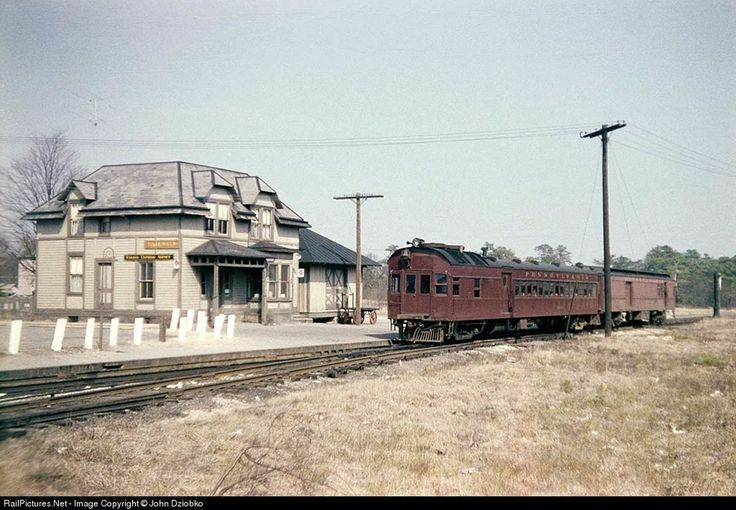 CJPat wrote: The old South Toms River Station still exists. it was relocated just a stones throw away and is now used as a house. It is located at 239 Halliard Ave, Beechwood, NJ. just off of Rt 9 by-way (Rt By-way used to be the Pennsy ROW). Just off the Parkway on the Rt 9 Pennsy ROW, there is a pump house or similar structure that looks very railroady. What was it previously? pumpers wrote: Yes, I don't know if NJ Southern only built the Whiting to Birmingham Jct (just west of SOuth Pemberton), or if they built the whole piece all the way to Mt Holly and/or beyond. I saw it all explained somewhere once, but who knows where! In 1834, the Camden & Amboy developed an interest to access Mount Holly. The Burlington & Mount Holly Railroad and Transportation Company was incorporated in 1848 to construct a line from Burlington (C&A) to Mount Holly. In 1863, the line was extended from Mount Holly to Pemberton. The name of the original railroad was changed by incorporation to the Burlington County Railroad Company in July of 1863. A branch from Ewansville to Vincentown was constructed in 1864. It was chartered in March of 1861 as the Vincentown Branch of the Burlington County Railroad Company. What later became the mainline of the C&BC was incorporated as the Camden, Moorestown, Hainesport, and Mount Holly Horse Car Railroad Company in March of 1859. This company was to construct the line from Camden (Pavonia) to a connection with the Burlington-Mount Holly Branch east of the present station on Madison Avenue. Before the line was completed and placed in service in October of 1867, it was consolidated with the Burlington County Railroad Company to become the Camden and Burlington County Railroad Company. The final segment of the C&BC was constructed in 1869 by the Mount Holly, Lumberton and Medford Railroad Company, which was incorporated in April of 1866. The Camden and Burlington County Railway company was created in October of 1915 by consolidating the Camden and Burlington County Railroad Company, the Vincentown Branch of the Burlington Railroad Company, and the Mount Holly, Lumberton and Medford Railroad Company. In 1925 the Burlington Branch was abandoned. Two years later the Vincentown Branch was abandoned. All but one mile of the Medford Branch was abandoned in 1976 after the formation of Conrail. The final mile was removed in 1981. I believe the "pump house" building you are referring to, located at 148 Mills St. (south) Toms River, is/was owned by the South Toms River Sewage Authority. The structure was built between 1972 and 1986 long after the PRR came and went from that area. Before that, it was just empty land. Disclosure - The photo belongs to John Dziobko and the url is off of pinterest.